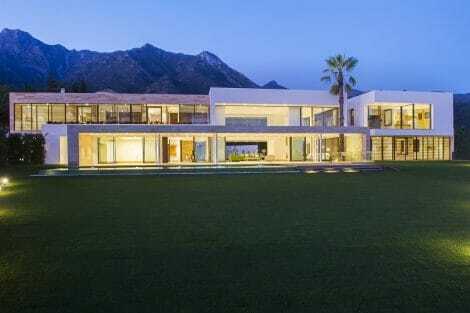 A respectable team of designers, architects and builders have teamed up to create this immaculate modern home with unrivalled modern aesthetics in a very privileged location. Recently completed outstanding property has been created using the latest techniques and modern technology, low-maintenance ecological solutions, high-end specifications, selection of exquisite materials, luxury finishing and designer fittings that make living here fabulous, safe and comfortable. It offers fashionable contemporary design with an innovative twist, combining the newest and coolest tendencies and traditional contemporary essence. 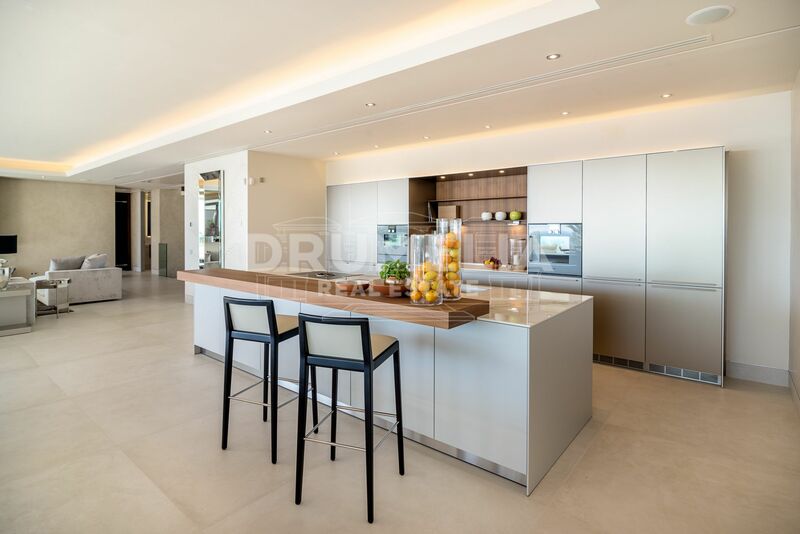 Exclusive property of 1.050 m² consists of the light-filled, luxuriously appointed, flexible living spaces: a spacious welcoming hall; an expansive open plan living room with full-width glass doors to amazing chill-out terraces, an interior lounge with beautiful bioethanol fireplace of modern geometric design, a dining area offering direct exit to al fresco dining table; an exceptional fully fitted designer kitchen by Bulthaup impressing with state-of-the-art Gaggenau appliances, charming wood elements, sleek countertops and cabinets, island and bar counter. 5 cosy bedrooms have fully fitted wardrobes, walk-in dressing areas, private terraces with solarium and chill-out corners, and en-suite luxury bathrooms offering fascinating design that includes micro-cement and extra-large pieces of high quality ceramic, personalized Italian furniture Inbani, Axor and Hansgrohe faucets and Villeroy&Boch bathtub in the main bathroom. 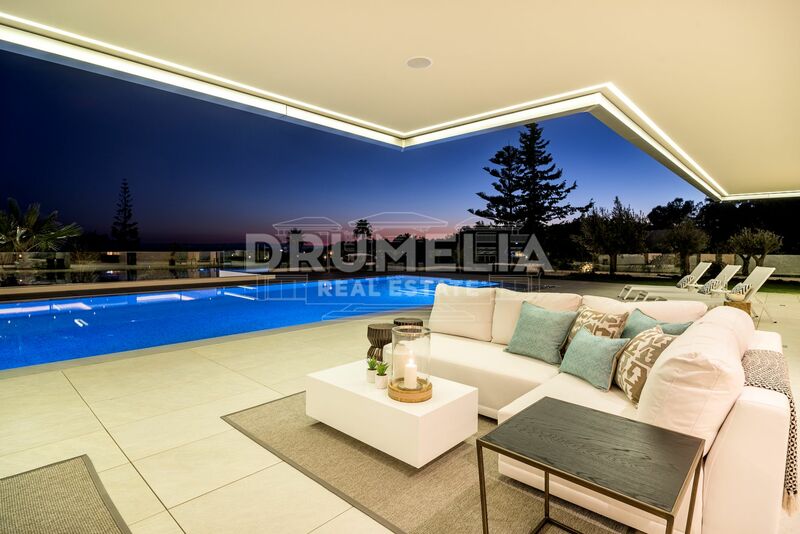 Amazing property has a large basement with cinema and fitness rooms, garage, modern style swimming pool with large window from it to the garage area, covered (210 m2) and open (464 m2) terraces with stylish balustrades and jaw-dropping views from all angles. 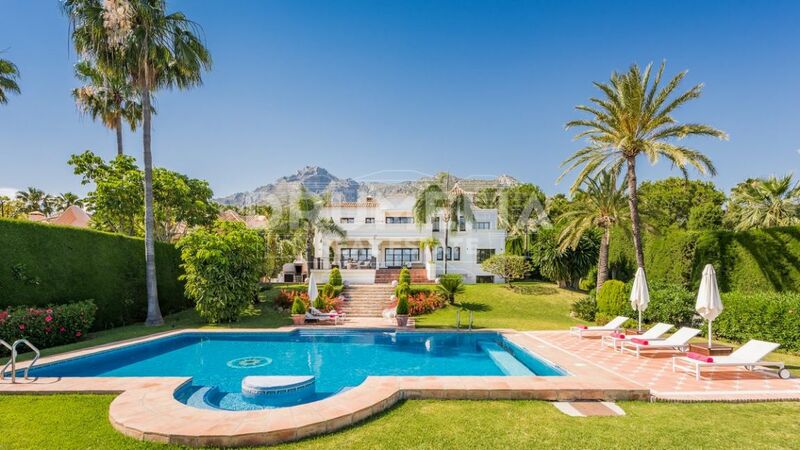 Perched upon a large (2.024 m²), perfectly located elevated corner plot well above street level, it enjoys panoramic views from southern part of Europe to northern part of Africa, capturing Gibraltar and Morocco, and majestic symbol of Marbella La Concha Mountain in the same photograph! Exceptional eco-friendly high-tech villa provides maximum comfort and top-quality life. There is nothing standard or average here – illuminated bathroom mirrors are extra-large; Italian Atlas Concord ceramic floor tiles on the ground floor also boasts extra-large size (1,2 × 1,2 m), special parquet flooring in upper bedroom and floating floor on terraces add to the appeal of stylish home, a beautiful staircase complements interior, Thyssen lift (4 pers.) has fully personalized with mirrors interior design; high quality double aluminium doors are bullet resistant; Internet / wi-fi is not only throughout living areas but also exterior, in all terraces and garden; ceilings are specially high: 7 m at entrance hall, almost 3m on ground and upper floors and in basement, 4m in master bedroom). All the features are of the highest standard: magnificent marble floors, underfloor heating throughout with independent controls, even basement; hot/cold Aerotermic energy creation system Daikin, LED lighting all around the house, including the garden and swimming pool (in different colours), Intelligent home system throughout with touch screens in each room, eye pleasing natural colour palette, remote controlled access to the house, etc. 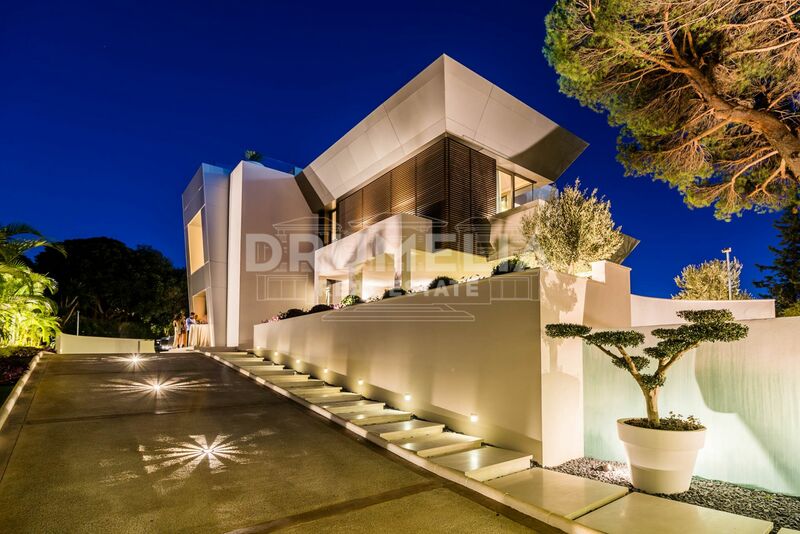 Prestigious and secure Nagüeles, known as Lower Sierra Blanca, is very close to all amenities, glamorous Puerto Banus (6km), Marbella Old Centre (3km) and has direct access to motorway leading to Malaga airport (30 mins). “They don’t come much more luxurious than Playa Nagüeles, with its fine and golden sand cleaned daily, both by machine and by hand, lifeguards on duty year-round, most exclusive restaurants and beach clubs. Playa Nagüeles is a playground for the rich and famous and the most exclusive beach on Marbella’s top ten best beach list”, confirms spain-holiday.com.